NETWORK UPDATE: All the adjustments were downward from this morning’s numbers, with 0.1 declines for THE MINDY PROJECT, SUPERNATURAL, MARRY ME, ABOUT A BOY and the 8:30PM rerun of PARKS & RECREATION. BET’s BEING MARY JANE returned to the Tuesday cable line-up and won the night at 1.16. It was followed by Discovery’s MOONSHINERS, up 0.18 from last week to 0.90, with lead-out BIG GIANT SWORDS up 0.08 to 0.53 and lead-in MOONSHINERS SECRET at 0.36. OWN’s THE HAVES AND HAVE NOTS was also at 0.90, up a tick from last week. ABCFamily’s PRETTY LITTLE LIARS lost 0.08 to 0.84, and SWITCHED AT BIRTH dropped 0.04 to 0.54. On Bravo, REAL HOUSEWIVES OF BEVERLY HILLS fell a heavy two-tenths to 0.77, and GIRLFRIENDS GUIDE TO DIVORCE held up fairly well given that shrunken lead-in, down 0.05 to 0.34. JUSTIFIED (FX) rebounded strongly from last week, up 0.17 to 0.67. TBS’s GROUND FLOOR, though, dropped 0.17 to 0.57, with COUGAR TOWN down 0.09 to 0.38. KATE PLUS 8 (TLC) slipped a tick to 0.54, and 2 episodes of MY BIG FAT FABULOUS LIFE were up a few hundredths to 0.52/0.48, while KATE PLUS 8 PLUS MORE gained 0.02 to 0.33. 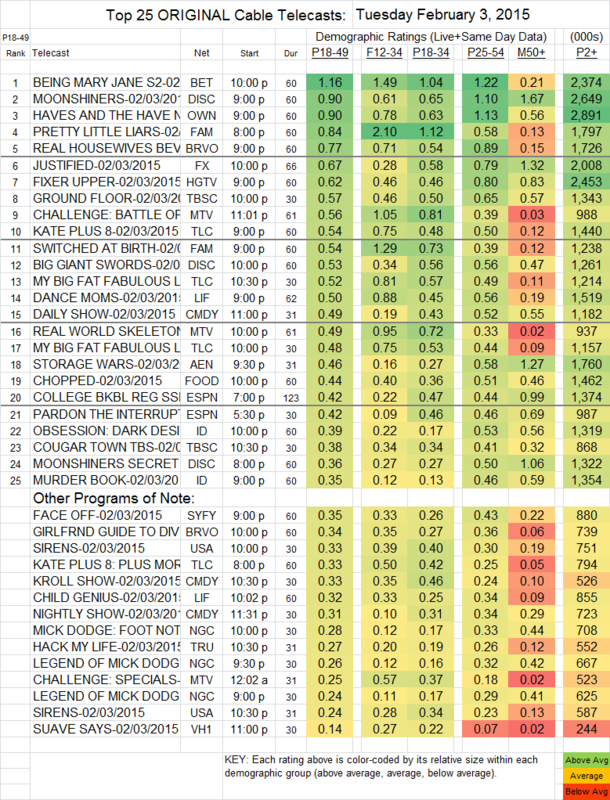 On MTV, THE CHALLENGE lost 0.02 to 0.56, and REAL WORLD: SKELETONS took a heavier hit, down 0.14 to 0.49. 2 episodes of SIRENS (USA) were at 0.33/0.24, down more than a tenth from last week’s 0.44/0.37. THE KROLL SHOW (Comedy) was at 0.33. FACE OFF (Syfy) dropped 0.08 to 0.35.